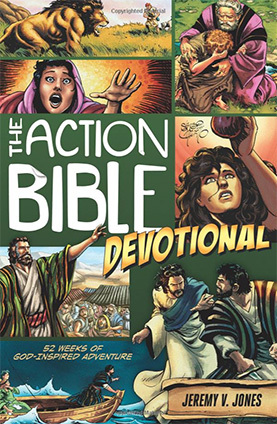 from The Action Bible with spiritual lessons and action –adventure missions in a 52–week devotional that launches kids’ faith into everyday life. Whether they’re drawing their own Bible story comics, dreaming up a list of life goals, or reaching out to a lonely kid at school, kids will say goodbye to Bible boredom with daily readings and activities based on the intersection of Scripture and a middle schooler’s everyday reality. Ideal for readers age nine to twelve, this hands–on guidebook takes faith off the page and sets it in motion for every young reader looking for a new spiritual adventure.